Free Shipping Included! 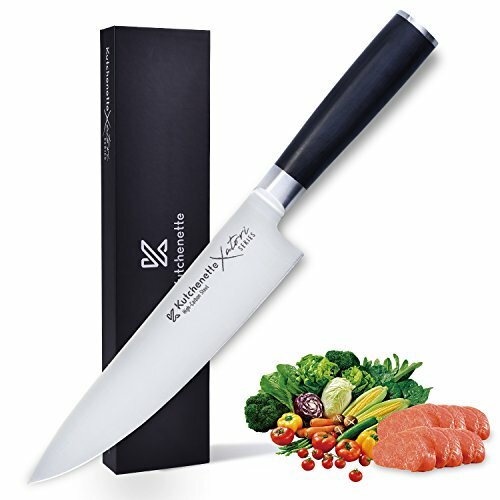 Sedge Chef Knife 8 Inch Professional Kitchen Knife Japanese High Carbon Stainless Steel With Black Pakkawood Handle With Case - Xatori Series by SEDGE at Baking Love. Hurry! Limited time offer. Offer valid only while supplies last. SEDGE Cutlery Xatori Series is ergonomically designed to fit comfortably in hand like no other. The black pakkawood handle allow the act of cutting to be light, relaxed, and nearly effortless. Each piece is designed and crafted for better slicing, dicing and chopping a variety of ingredients, including fruits, vegetables, small cuts of meat. Because of its good quality and good looking, you can choose one knife as a special gift to your families or friends. ULTRA SHARP BLADE - High-Carbon stainless steel blade is quite sharp and will remain this way even after cutting tough meat or removing flesh from bones. ERGONOMIC PAKKA HANDLE - The handle is made from Pakkawood, which is a material that known for its comfort, strength and stability. Ergonomic handle can minimize any fatigue, finger numbness or aches after holding knife for a long time. The Pakkawood (sourced from Africa) is unique for each handle; luxurious & beautiful. SEDGE LIFETIME GUARANTEE - 100% SATISFACTION OR MONEY BACK GUARANTEE, try it risk free. We guarantee a superior product that will give you a lifetime of exemplary service. With the luxury case it is also the wise choice as a gift. If you have any questions about this product by SEDGE, contact us by completing and submitting the form below. If you are looking for a specif part number, please include it with your message.